Sebumasque is blemish-prone skin’s BFF. It helps absorb surface oils and acts as a gentle skin polisher thanks to the micro-exfoliating properties of Kaolin clay. This masque also helps to hydrate skin, revealing a more radiantly clear and beautiful complexion. *Warning: Consumer allergic to salicylic acid should not use this product. Salicylic acid is included to assist in the natural sloughing of the skin. Moisturises the skin so that your complexion looks revitalised and radiant. Contains an excellent exfoliant that gently polishes your skin. Has a cooling effect that leaves your skin feeling calm and soothed. Apply on top of Sebuprep, massage with your fingertips and then rinse off with water. 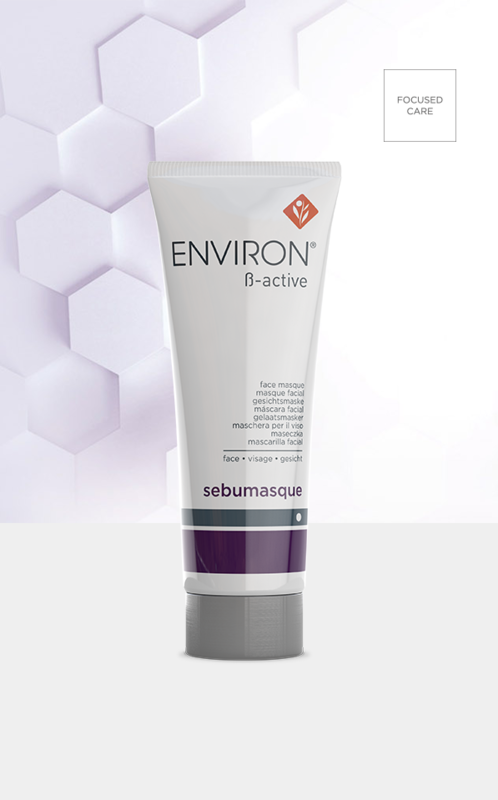 Remove last traces of the masque with Sebuwash, tone the skin and apply your recommended Environ vitamin A moisturiser. Gentle enough to use daily. Pre-cleanse, cleanse and then apply the Sebumasque evenly over the face. Leave on for a minimum of 10-20 minutes. Alternatively, it may be applied over Sebugel A and left on overnight for an enhanced moisturising and soothing effect. This multifunctional pre-cleanser helps to dissolve excess surface oils and assists in removing environmental impurities. A mild, low-foaming gel cleanser containing tea tree oil that gently removes excess surface oil whilst maintaining skin’s natural moisture balance. A toner formulated to assist in hydrating and refining blemish-prone skin, giving it a smoother appearance and a beautifully radiant glow. A light water-based treatment gel containing a low concentration of vitamin A, formulated to assist in reducing visible oiliness, leaving the skin feeling soothed and moisturised.